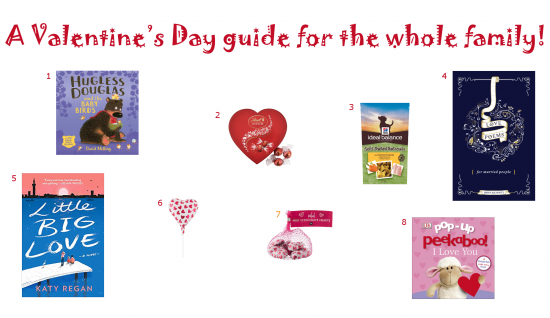 A Valentine’s Day guide for the whole family! Since Amy was born it’s become a yearly tradition for us to go away to celebrate Valentine’s Day. And although this is in line with my philosophy of collecting memories and not things, I do enjoy spoiling the special people in my life so I have always bought everyone in the family a small present to open while we’re away. This year I thought I would share a few of the awesome Valentine’s Day goodies that have caught my eye. I hope it gives you some inspiration and encourages you to still celebrate this holiday even if you’re at home together with your kids enjoying a fun dinner and movie night instead of painting the town red just the two of you. The most important thing to remember is your love for one another. At the top of my list are a few new love themed books, perfect for a special storytime for the children and something fun for you and hubby to read too. If you’ve got little ones (babies to three years old) then don’t miss the new Pop Up Peekaboo! I Love You board book, great for introducing toddlers to reading and guaranteed to keep them guessing what’s hiding behind the flaps. Older children (aged three to seven) will enjoy Hugless Douglas and the Baby Birds, a new adventure which sees the endearing brown bear looking after a nest full of eggs. While I haven’t read Love Poems for Married People yet, I can’t wait to because this new collection of fun and witty poems about being married looks like it will make both this mom and dad giggle. Little Big Love by Katy Regan is also on my to be read list, a romance novel about a young boy who sets out on a journey to track his father down, who despite having disappeared from his life still remains the only man whom his mother has loved. It just isn’t Valentine’s Day without chocolates, and I love this new red heart shaped box of the delicious and decadent Lindt milk truffles (it’s up to you whether you choose to share these with the family!). My kids always love lollies, so I’m definitely surprising them with these lovely milk chocolate heart lollies and adding a little milk chocolate heart to each plate will help make your dinner time table pop with colour. And because we all know that chocolate is a big no-no for our furry friends you can also spoil your dogs with a few tasty treats from Hills (they even have carrots snuck inside!). Disney celebrates 90 years of Mickey! Keep warm this Winter with Prima Toys Games Festival! Top Unicorn books for children of all ages! Lois Carol Wessels on Win a limited edition Silistraw plus a plush bunny! Tanya Marks on Win a hamper of Easter books from Penguin Random House SA! Bhavana Singh on Win a hamper of Easter books from Penguin Random House SA! Win a limited edition Silistraw plus a plush bunny! Win a hamper of Easter books from Penguin Random House SA!